I love TED. Not a man, but the group. TED is a nonprofit that is devoted to "Ideas Worth Spreading." There have been several videos that have gone viral and a blog that really enjoy written by Hannah Katy was recently added to the iPad TED line up. Yesterday my mom sent me a video of Shawn Achor speaking, called "The Happy Secret to Better Work." Right before falling asleep I decided to watch this video as a way to wind down. So I dimmed my computer screen and lowered the volume (I had the start of a migraine) and began to watch. I instantly liked this speaker and knew I would like the video, which has only happened a couple other times. 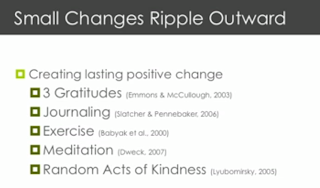 Image taken from Shawn Achor TED Video. See "Happy Secret" Link above. I know that didn't hear the whole message of the video as I was exhausted. But what I did get was a few laughs and this... small changes can make a big difference. 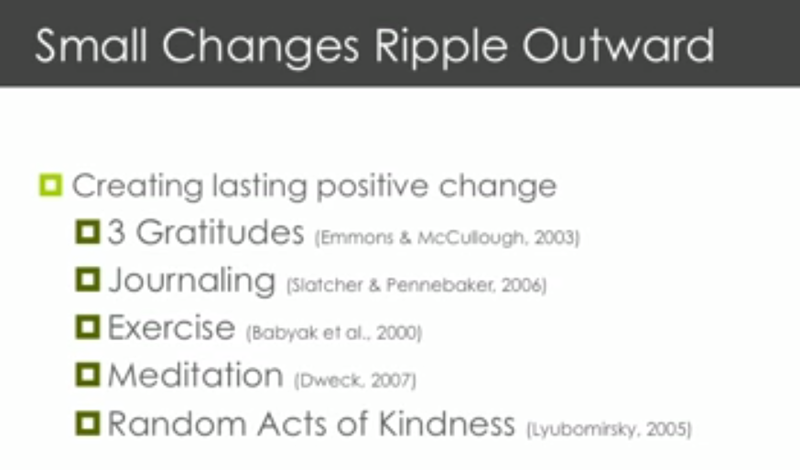 Shawn posits that 5 small changes (outlined to the left) can increase our happiness and thus our productivity. Each serves a purpose (you really should watch the video... this part is outlined in the last two minutes). I felt inspired to give it a try. Because who doesn't want to be a little happier, right? "Write three new things that you are grateful for, every day, for 21 days. First, for the next 21 days (really the rest of December) I am going to try and write 3 gratitudes and journal one positive from the previous 24 hours on this blog. Second, I am going to get more movement into my life. While it's not full blown exercise, it's sure as heck more than I'm doing now. Third, I will try some form of meditation at least three days a week. Fourth, I will try to be more gracious and thankful to the people in my life. Writing a positive email, text message or in conversation. I will do this at least three days a week, if not more! Then we shall see in three weeks, at the start of a new year, if I feel a little bit happier and a little more productive! Even if the productivity doesn't increase, the practice of being consciously aware of the positive will be a great experience.